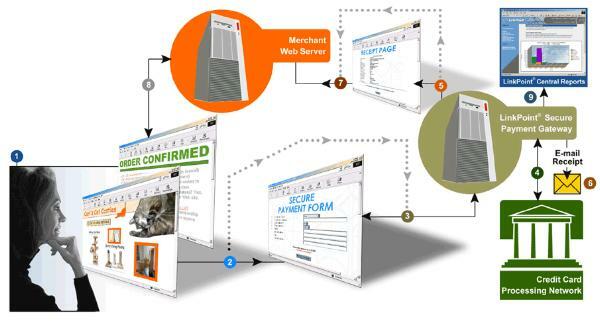 LinkPoint Connect is the transaction solution that easily enables any website for ecommerce. This innovative transaction processing software allows you to process credit card transactions by using a simple Hypertext Markup Language (HTML) form on your web site. LinkPoint Connect takes care of all the financial processing behind the scenes and deposits money earned from your orders directly into your merchant account. LinkPoint Connect is pre-integrated with many popular ecommerce shopping cart applications. If you decide to use one of these third party ecommerce solutions, most of the work has already been done for you. If you are developing a custom ecommerce website, LinkPoint Connect is so simple to integrate that even a novice web designer can get up and running in a very short time. The flowchart below shows how LinkPoint Connect works. Once you have developed your website you simply create an order form, copy and past a few HTML tags and you’re ready for business! A customer visits the order form located on the your web server. The customer selects the item they want to purchase and clicks on the Pay Now button. The customer is then transferred to a highly secure payment form hosted on one of the LinkPoint secure servers, where they enter their billing and shipping address, and their credit card number and expiration date. The customer can then review the receipt page, confirming the details of their approved credit card transaction. LinkPoint automatically sends an e-mail receipt to the customer for their purchase. All order and payment information is posted back to the merchant’s web server. Finally, the customer is returned to an Order Confirmed page on your website that outlines the details of the order and reminds the customer that a receipt has been e-mailed. LinkPoint Connect has the flexibility to collect as little or as much order data as you need, safely and securely. If you don't have a secure web server for collecting sensitive information, LinkPoint Connect can collect the secure payment information for you. How much information we collect and what fields you include on your order form(s) depends on the payment mode you select: PayOnly, PayPlus, or FullPay. If you have a secure server available and the expertise to appropriately handle secure payment information, you can choose to collect the payment information yourself, and use LinkPoint Connect as your back-end payment processor. The whole payment process is automatically handled, quickly and easily, with LinkPoint Connect. LinkPoint Connect receives orders from your web sites, handles all the necessary financial transactions, and deposits your money directly into your account. If the consumer includes an e-mail address with the order, LinkPoint Connect automatically sends them an e-mail receipt. The merchant can also receive an e-mail notification for every order they receive, if they choose. Fraud protection - Provides crucial preventive measures that allow merchants to block specific credit card numbers, Internet protocol (IP) or Class C addresses, customer names, or domain names. Address Verification Service (AVS) - Helps merchants combat fraud by comparing the consumer's billing address with the address on file with the card-issuing bank. If the two match, you know there is a lower chance of fraud.